A strong contender for England’s most beautiful small city, Bath has a knockout combination of historic splendour and a good-time attitude. The Romans put it on the map 2000 years ago when they built their public bathhouses on its natural hot springs. People came here to socialise and ease away the stresses of the daily grind. The 18th century was Bath’s heyday, when the grand Georgian buildings of The Royal Crescent and The Circus were built to house all the fashionable folk who came here to see and be seen. The grand architecture of this time sets the tone of the city to ‘splendid’ and ensures that any event here is a cut above. There are picturesque scenes everywhere you look, from ancient cobbled alleys to historic chapels and buzzing modern streets. On the southern edge of the city, you’ll find walks with breath-taking views at the Bath Skyline Walk and Prior Park Landscape. At Christmas time, the views are especially picturesque when the festive lights sparkle and there’s a frosty glow on the rooftops. 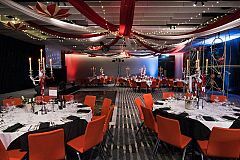 If you’re looking to host your Christmas party in Bath, then you’ll want to find the perfect venue to celebrate the festive season. We work with a variety of trusted venues who will bring you the best that Bath has to offer; whether you’re after a Christmas lunch or dinner, or whether you’d prefer a larger scale party night, then there’s something in this great city for everyone! Browse our top selection of shared and exclusive parties and send an enquiry through to your chosen venue today! If you’re up for a bigger bash and like the idea of mingling with other companies, a shared Christmas party in Bath could be the event for you. This is a popular option for small-to-medium-sized teams who want to benefit from the high production values and incredible venues available, all whilst sharing the experience and the costs with other teams. You might even find it turns into a networking opportunity, but the main point of a Christmas party is to have a good time and reward your staff for their hard work throughout the year. Perfect for those larger companies that are looking to celebrate the festive season with their own team, an exclusive event in Bath will be sure to provide everyone with an unforgettable time. The bonus of opting for an exclusive event is that you won’t have to share the event space with other groups, meaning that the evening will be totally private for you and your colleagues. 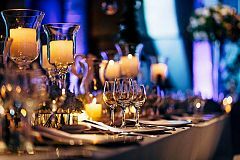 You’ll be able to rely on the dedicated events team at our handpicked venues to guide you through the process of booking your exclusive party night, so can enjoy complete peace of mind. When it comes down to dining options, our venues are happy to provide special meals for those with specific dietary requirements and there’s always a great variety of optional extras that can be added such as drink packages to make your evening extra special. Make your exclusive Christmas party one this year that ticks all the boxes and rounds off the working year with a bang! Sending an enquiry through to your venue of choice really couldn't be easier. All you have to do is fill out the enquiry form on the party package that you like the look of and hit send. This will go straight through to the venue who will be in touch with you to discuss your party requirements further. You'll also receive an email from us here at Eventa, to provide you with with a unique reference number for your records.